Additionally, a donation was made to the UTC Veteran Entrepreneures Program in honor of the six judge's time and effort towards the selection process. 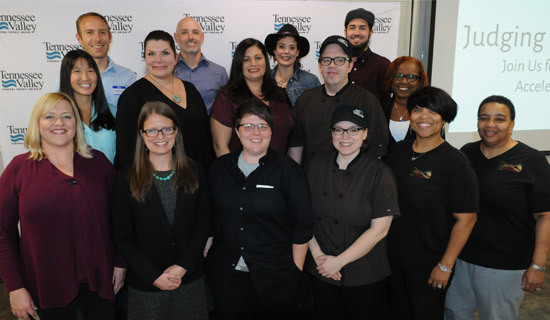 CHATTANOOGA, Tenn. (Oct. 19, 2018) — Tennessee Valley Federal Credit Union is proud to announce the ten Idea Leap Grant finalists. The group of ten entrepreneurs will vie for one of five grants, totaling $50,000, on Tuesday, Oct. 23, at 6 p.m. on Floor Five of the Edney, located at 1100 Market Street in Chattanooga’s Innovation District. This is one of more than 100 startup-focused events as part of Startup Week Chattanooga. "During Startup Week in 2016, we announced that we were creating a loan product specifically tailored to small businesses called the Idea Leap Loan Initiative," said Tommy Nix, vice president of business and commercial services at TVFCU. "Two years later we are excited to reinvest the Idea Leap Loan proceeds back into the community in the form of the Idea Leap Grant — and give away $50,000 to local business owners." At the event, each finalist will have three minutes to pitch their business and what they would do with the grant funds before a panel of judges and Startup Week audience members. A brief Q&A session with judges will follow each presentation. Once all the presentations are complete, the judges will deliberate and assess the finalists according to a set of five assessment criteria. During that time, audience members will have an opportunity to network with other attendees. The evening will conclude with the announcement of the five grant recipients. First place is $20,000. Second place is $15,000. Third place is $10,000. Fourth and fifth places are $2,500 each. Come early for the Pre-Pitch Reception Hosted by Co.Lab from 5 to 6 p.m. in the Edney’s Floor Five Accelerator Space for light refreshments and to network with the finalists. The pitches will begin at 6 p.m. in the Edney’s Floor Five Community Space. Cashew was founded in 2013 as a vegan restaurant offering fresh, healthy and creative foods where nearly every menu item is made from scratch. It quickly became a top destination for locals and tourists alike seeking a delicious but nutrient-packed meal. Our cashew based vegan cheese sauce, which is sold under the brand Cha Cha Vegan, has grown in popularity over the years and is now served in five other restaurants and one retail store in the Chattanooga area. We are currently working towards establishing a dedicated production facility for Cha Cha Vegan to streamline the process of making and packaging our product in order to keep up with current demand as well as provide the ability to scale our production while seeking new partnerships. Learn more at cashewchattanooga.com. The Chattanooga School of Language offers the highest quality language instruction in 17 different languages to people of all ages and proficiency levels through small classroom settings, flexible schedules and cultural activities. With a team of passionate and dedicated language instructors, CSL provides students with the structure and personal interaction they need to achieve their personal and professional goals in language acquisition and cultural understanding. As the recipient of the 2018 Small Business of the Year award (1-20 employees) from the Chattanooga Area Chamber of Commerce, the language school is uniquely and strategically placed to continue meeting this growing need and, thus, creating a more aware, educated and inclusive community through the teaching of language and culture. Learn more at chattanoogalanguage.com. At Dipped Fresh we believe that people should be able to eat well and eat healthy, without it costing an outrageous price. To that end, Dipped Fresh serves the best products at very reasonable prices, while providing healthy alternatives to long standing favorites. Learn more at dippedfresh.com. Dish T’Pass is an award winning, full service catering company with a recreational cooking school serving Chattanooga’s corporate and nonprofit communities since 2012. Spreading our foodlove philosophy to the Chattanooga community and beyond, we don’t just make and sell food. Just like the family dinnertable, we share an expression of love through food and form lasting connections with our clients. We are also available for private events and weddings. Learn more at dishtpass.com. The Hot Chocolatier is a European inspired gourmet specialty shop producing artisan chocolates, desserts, and drinks. We are Chattanooga’s unique dessert destination for connoisseurs of sweets. Our products are created with high quality ingredients and presented beautifully and artistically to match their exquisite taste. The Hot Chocolatier offers customers the opportunity to spoil themselves or give memorable gifts of luxurious handmade chocolates and desserts. Learn more at thehotchocolatier.com. Inspire Chiropractic is a family wellness practice that specializes in pregnancy and pediatrics. Drs. Becky and Joe Klein are passionate about the health and wellbeing of women and children. We inspire families to be healthy and happy to reach their full potential in life. Learn more at inspirechiro.com. Locals Only Gifts & Goods is a retail gift shop and gifting service that sells only products made in Tennessee. We specialize in Chattanooga makers of small batch and artisanal goods. Locals Only is also the home of the Chattanooga Gift Box, a gift box filled with Chattanooga's favorite local goods that everyone loves to give and receive. Learn more at localsonlychattanooga.com. LoAdebar is a real whole food energy bar that is handmade, and loaded with only certified organic ingredients that are also vegan and gluten-free. Though specially formulated to fuel endurance athletes, it also appeals to people of all ages and fitness levels who are looking for healthy nutrition on-the-go as an alternative to processed snack foods. LoAdebar is available in two flavors (original and real dark chocolate) and two sizes (meal size or bites). Learn more at loadebar.com. At Mad Priest Coffee Roasters, we believe in producing the best coffee and equally believe in creating a business that educates and empowers. With years of experience in the industry, we are constantly honing our coffee craft and want to use our business as a means to solve bigger issues of displacement, inclusion and equality in our community. Learn more at madpriestcoffee.com. Skye Strategies is a grant development, capacity building and evaluation firm helping nonprofit, education, healthcare and government organizations secure funding to expand their impact. Over the last six years, Skye Strategies has evolved into the premier grant development firm in the Chattanooga region, securing over $40 million in funding for our clients through a diverse program portfolio. Key services include: grant planning and research, program design, grant proposal writing and editing, budget development, metrics development, award management, grant outcome reporting, evaluation and development staff coaching. Learn more at skyestrategies.com.